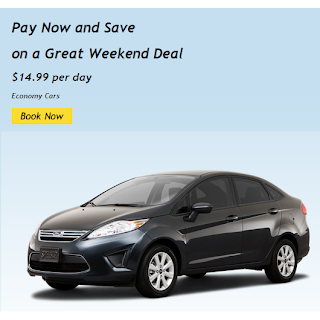 This week Hertz announced the return of its weekend special - which gets you an Economy car for $14.99 per weekend day. This came on the heels of Budget's Wendie weekend deal announced last week, which in turn came right after Enterprise came out with their $9.99 per weekend day deal. Hertz is offering a Compact/Economy car for $19.99 per weekend day at participating Hertz corporate locations in the U.S. If you're willing to pay upfront, you can save $5 per day and book your vehicle for $14.99 per weekend day with the Pay Now option. Weekend rental require pick-up Thursday 12:00 noon to Sunday 23:59 PM and the vehicle must be returned by Monday at noon or higher rates apply. Thursday and Friday pickups require a Friday night keep. The deal is valid on rentals commencing through 11/30/2013. There are a bunch of very good alternative like the Wendie Deal from Budget and the Enterprise weekend special. Unlike the Enterprise weekend deal which is valid only in neighborhood locations, this deal is valid at all Hertz corporate locations. This means that while it'll work at Airport and a number of Neighborhood locations, it won't work at HLE locations. While it doesn't say so, the deal has a 0% chance of working anywhere in the New York Metro area. Tough luck! This deal is pretty darn GOOD!